“Act fast or be dead” says a character at one point during The Death of Stalin, a resonant line that speaks volumes about the plot of director Armando Iannucci’s Soviet-era black comedy. The subdued setting of a Russian concerto provides the perfect stage for the film’s opening scene: the serene mood shattered when comrade Joseph Stalin himself rings Paddy Considine’s concert hall worker to request a recording of the show (which, unfortunately, doesn’t exist). Fearing for his life, he hastily arranges for a second performance despite the dispersing crowd, a rebelling pianist and a conductor so terrified at the prospect he passes out. It’s a fantastic opening which shows the wanton paranoia and fear which dominated Stalin’s reign, while also finding laughs in escalating mayhem and panic. This fine line between the chaotic and the blackly comic dominates The Death of Stalin which centres, as the title makes obvious, on the death of the Russian tyrant (played by Adrian McLoughlin) in March 1953. After a night of drinking, feasting and films with his “politburo”, Stalin collapses suffering what transpires to be a cerebral haemorrhage. His imminent death, still the subject of debate and mystery to this day, is met with dread, paranoia and immediate scheming from his cronies. “How can you run and plot at the same time?” – Steve Buscemi’s Nikita Khrushchev is asked in a woodland walk outside Stalin’s country home mere hours after the leader’s collapse. As the plot unfolds Iannucci doesn’t hold back in his depiction of this cast of crass, despicable characters; exposing them as wretched, image-obsessed, power-hungry sycophants across two hours of Machiavellianism and backstabbing. Iannucci never allows the audience to forget the dark and disturbing reality of this awful period of modern history, with the comedy never far away from the horrors of Stalin’s reign. 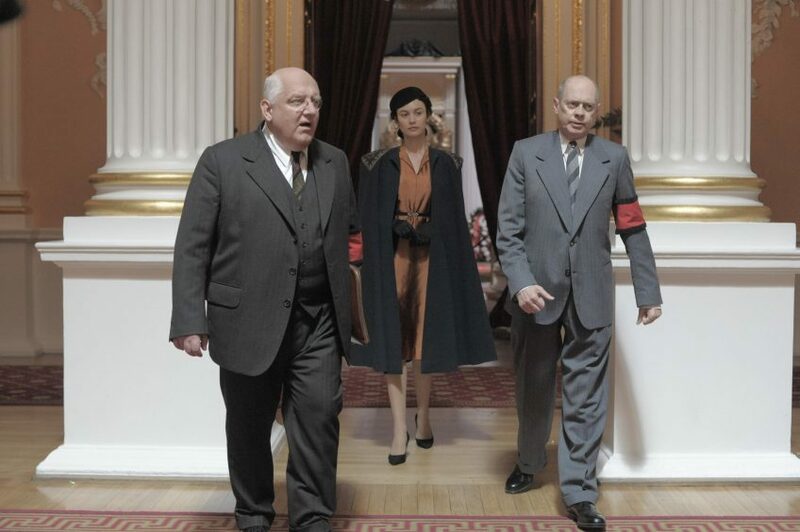 This juxtaposition is embodied best by Simon Russell Beale in his performance as Soviet security chief and former head of the NKVD, Lavrentiy Beria; a chilling character who nonchalantly dishes out orders to slaughter men and women deemed enemies of the state. The line “shoot him, kill her, make sure he sees it” is delivered coolly, like so many jokes in the film. 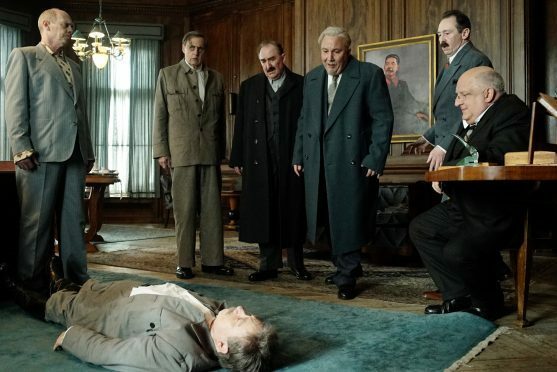 Buscemi is a class act as the conniving Khrushchev and Rupert Friend as Stalin’s drunkard son Vasily is hilarious; his manic performance one of the highlights of the film. A scene where he witnesses his father’s autopsy (“they are killing his brain with American lies!”) is brilliant. Andrea Riseborough is also great as Stalin’s daughter Svetlana, one of few characters in the film resembling a moral human being. 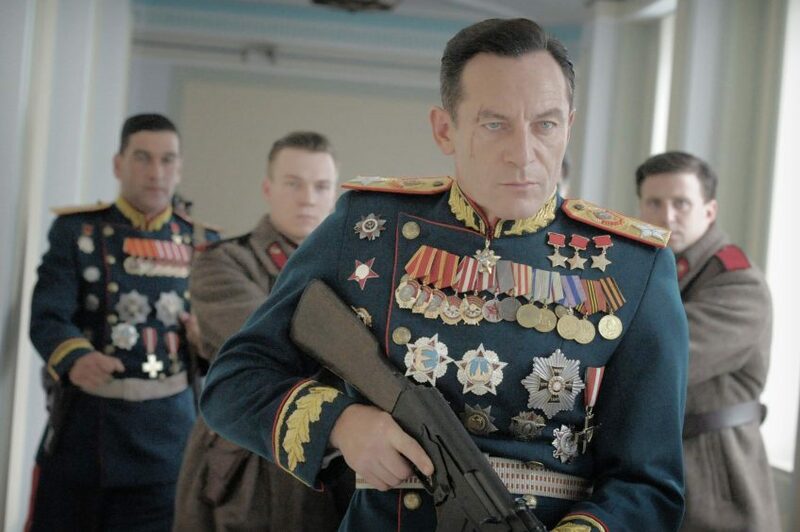 However, Jason Isaacs is particularly enjoyable to watch as the hard-as-nails army chief Georgy Zhukov. Donning countless war medals, and with a thick Sean Bean-esque Yorkshire accent, Isaacs relishes some of the best lines of dialogue in the script (“I f****d Germany, I think I can take a flesh lump in a waistcoat”). Michael Palin is another highlight as Vyacheslav Molotov. In one of the film’s funniest scenes his character holds the balance of power in a committee meeting, torn between a moral objection to a vote and his commitment to “collective leadership”. It makes for great satire. The Death of Stalin constantly switches between the funny and the dark, and so too do its characters. One minute content and the next minute rebellious; simultaneously grieving and scheming; jovial and then murderous. 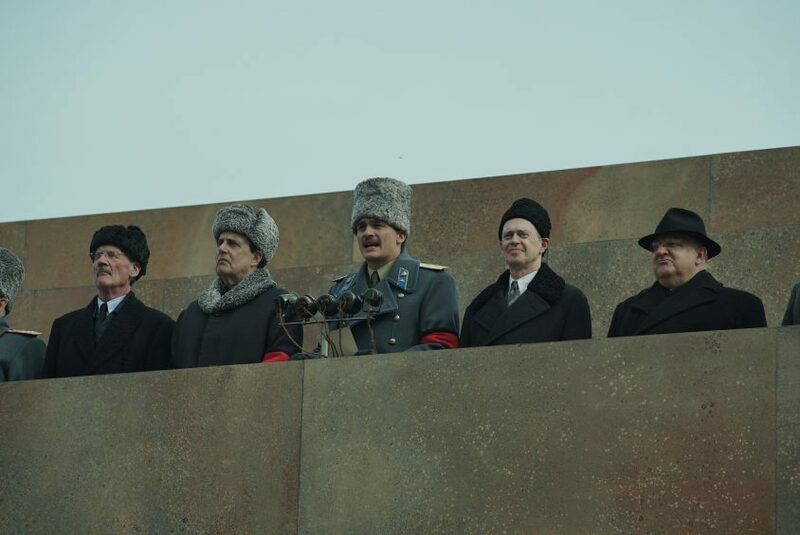 Much of Iannucci’s work has satirised the worlds of British and American politics, but The Death of Stalin is a study of enormous power and control in the hands of a small group of deceptive and sinister men. The film’s structure is dictated by Soviet protocol in the event of Stalin’s death, with the documentary-style Iannucci adopted for In the Loop cast aside. Technically impressive, endearing camerawork compliments impressive sets with shots of Moscow and its architecture often drawing to mind the opening scenes of Woody Allen’s Manhattan. At the risk of detaching the story from “the motherland” itself the British and American accents of the cast are favoured over Russian ones. Ukranian-born Olga Kurylenko as unruly pianist Marias Yudina is the exception; bringing a personal touch to the role. So how does a director make light of a story so dark? In reality the men at the centre of this story oversaw the deaths of millions of Russians, and the incarceration of just as many into labour camps, during their time in power. Many were active supporters of Stalin’s purges – the Soviet leader’s bloody solution to silence his political enemies. Iannucci’s answer is to portray the men responsible for so much death, terror, suffering and starvation as the hapless, callous, egotistical sociopaths they were. As the film enters a final act full of treachery one character quips that “Stalin would be loving this”, with the story ending on a surprisingly haunting and brutal climax that will linger long in the mind. 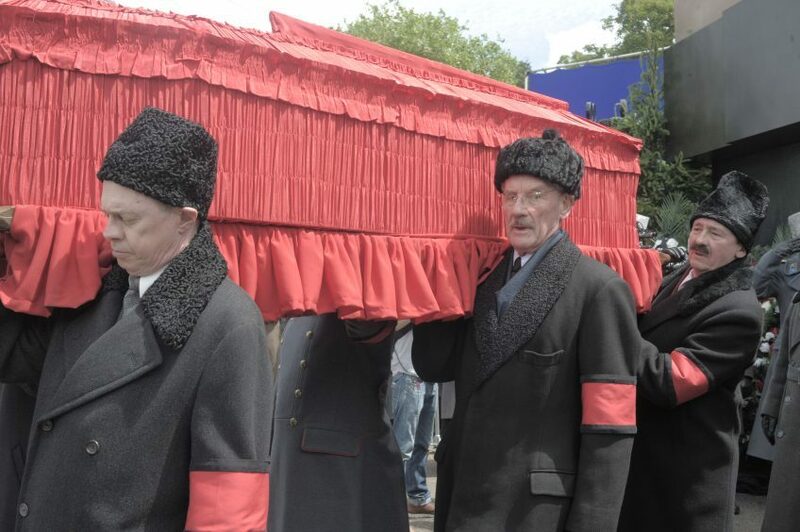 The Death of Stalin is perhaps Iannucci’s best piece of satire yet. Despite the hilarity, it never allows the audience to forget that there were few laughs during this dark and disturbing period of 20th century history.